I've received a ton of requests for eggplant Parmesan, and I finally got around to filming my "low-fat" version. Speaking of requests, the most common request I get is for fried foods - fried chicken, onion rings, tempura, french fries, et al - and I always send the same basic reply; great fried foods requires a large commercial deep fryer to really give you the results you crave. You can do a few things small scale at home with a fry-daddy, but for the most part those deep-fried delicacies you want me to demo are best ordered out. Normally, eggplan t Parmesan would fall under this "needs to be fried to be good" category, but in this video recipe you'll see my method for a much easier casserole-style version. One problem with eggplant is they soak up and incredible amount of oil. They can't help it, it's their nature. To counter this, we reserve the crispiness for the top crust. By using a nice thick layer of crunchy Parmesan breadcrumbs, we get a very similar fork full of food, but at significant caloric savings. Enjoy! Eggplant are so beautiful. I keep buying them at my local farmers market and bringing them home because they are so pretty, but I haven't found a way to use them yet that I like. I will try your recipe this weekend! Looks great! I love eggplant parmesan but have never been able to reproduce it at home so I'm excited about this. One question--when you say tomato sauce, do you mean like jarred pasta sauce or plain tomato sauce? the trick is to soak them in salted water for a few hour before cooking them..
Where did 17.4 come from? where most of my stats come from...I made it up. Sigh. To try or not to try that is the question. While it is possible I have never had well prepared eggplant (sorry mom) I have never much cared for the stuff and generally avoid it. The recipe looks delicious but I would hate to waste all that yummy cheese only to discover that the eggplant is still awful. lol Awww heck. Nothing ventured, nothing gained. the food Gods hate a coward. I'm with Chef John on this, Hygienist. While I don't know you, You're probably not 80 years old. I'll bet you're wondering, "..and that would be important because...?" Scathing comment left on "that" site. Not a huge fan of eggplant, except in eggplant Parmesan (probably because of the cheese and oil). I will definitely have to try this healthier version and see what I think. I really don't care either way, but I used Parmesan instead of Parmigiana since it's searched for twice as much as the correct term. Since I get much of my traffic from people searching google I use what will bring in the most viewers. Everyone else should use Parmigiana so you don't get annoyed. Well Chef John hasn't steered me wrong yet I'll have to give this one a try. And no Pam I am not 80 and won't be for a few decades yet. I promise not to wait til then try this recipe. Awesome recipe. I cant wait to try this one. Maybe I will even cook it this weekend for myself, bachelor style. ie. freeze half and live off of it next week! Although tough getting pepperjack in Germany I think, but everything else I can get. I had some leftover eggplant so I made this dish last night. It's very good. I didn't have enough eggplant to incorporate it into the sauce so I just used a decent (Pastene) spaghetti sauce. The shredded pepper Jack was excellent and there's no need to think mozzarella is needed. Yum Yum Yum I doubt I used even a tablespoon of olive oil so it's a relatively healthy dish. Hi Chef John Tried your eggplant parmesan and liked - but not loved -it. I think leaving the skin on made it taste a bit bitter. I will try again without the skin and see if that improves it. Otherwise I think it is a reasonable alternative to the deep fried version. Maybe the flavor (bitterness?) will mellow with anight in the fridge? Leftovers will tell the story tomorrow! Cathy PS I LOVE the sound of your voice! No bitterness there! bitterness varies from eggplant to eggplant. You can salt it and let the juices drain, this helps sometimes. Just rinse before you use. Thanks! i made your eggplant parmesan casserole tonight for my mom, brother, and boyfriend. i'm 23 years old and believe it or not, this is the first time i've ever cooked with a recipe. (usually i just make stirfrys and soups out of whatever is in the fridge). i obviously have very little cooking experience, but your recipe and video was so easy to follow! i pulled it off! can you believe it?! and everyone LOVED it! they are all asking when i will make it again. your blog is a great resource! Ooo. This was good. Even though I didn't have all the right types of cheese. The poor eggplants looked like they were crying "feed me" when I restricted their oil intake though though. I love olive oil. It was hard not to give in. I was concerned about solanine and did enough research to somewhat confidently assure myself that the solanine mostly gets cooked out when you fry them. Definitely making it this way from now on, the regular version makes me feel a little sickly from being stuffed full of oil and cheese. Just tried this recipe about a week ago for a family gathering...needless to say everyone loved it! People kept going back for seconds and thirds...awesome recipe, definately a do over! Thanks! Hi Chef - several friends and I get together once a month for board games and dinner, and this month I made this casserole. To feed all of us, I doubled the recipe; I was a little concerned that it wouldn't turn out as good as it probably does in the smaller casserole dish, but I think it didn't suffer too much. I brought home an empty dish, so I guess that says something. (-: Thanks! kind dissapointed with the outcome...bread crumbs and parmeggiano overtake all the rest of the flavors. Not my cup of tea although I love Aubergines. This turned out perfectly!! I sautéed onions and mushrooms along with the diced eggplant for the sauce. 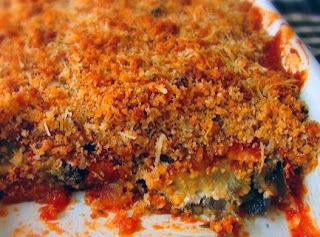 What do you think of baking the eggplant slices in the breadcrumb mixture and layering with your ceese mixture finishing on top with cheese instead? I am about to make some form of eggplant parm for the first time.. I really don't like eggplants but this recipe is worth a try. I would love to make some. Ugh, this was gross. BUT, it wasn't the recipes fault, more like the eggplant's. I ordered it from Peapod.com. Even though I love Peapod, eggplant is something you should probably pick out yourself. They were very small, VERY soft, and brown in parts. One bite and I gagged. We pitched the hole batch and ordered take-out. I'll try this recipe again but with eggplant I picked out myself. OK, I can’t keep telling my Calabrese/ New York relatives that this is simply an “eggplant casserole” – it sounds too “grandmaish”, and doesn’t do this tray of magnificence much justice in my opinion. P.S. There is nothing worse than under cooking eggplants folks. Don't be afraid to let 'em cook. That could be where you hit a road bump. Thank you for this recipe Chef John!! I always thought eggplant parmesan was "okay". Part of me knew it COULD be awesome, and this recipe proves it. I have made it delicious before, but it was always so much work. Thank you for a ridiculously easy recipe free of all that salting and sweating the eggplant, breading, frying, etc. nonsense. So easy and truly the best I've tasted. I just found this recipe by coincidence, and realized it was the first recipe that I ever watched from Food Wishes! It's been a while since then... and you're even more awesome than ever! Thanks Chef John, for being the best. Hi Chef, I am a vegetarian, and I came across this website while searching for melanzane parmigiana in allrecipes. The video was excellent...I tried making it last night, and my husband swore he will never eat another eggplant parmesan anywhere other than this homemade one...he was completely impressed with the flavour...my kids had the leftovers for breakfast! Thank you! This is the third time I've made this dish, the second time making it with homemade ricotta cheese. ok, gotta ask...do you have a garden? Hi chef John! I am your newest fan and a cook of two weeks! All thanks to the discovery of your blog which brought life to my boring kitchen (and to my husband's stomach)! Eggplant is the next thing on my curriculum. Since I live in Korea, it is hard to get ricotta cheese here. What could it be replaced with? Cottage cheese would be the closest but not nearly as good! Thanks! Why did you slice the garlic instead of mincing it. 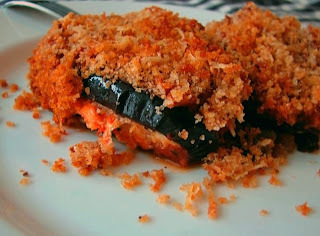 I love this recipe - delicious, easy and healthy (compared to other Eggplant Parmesan recipes). And hey, Chef John, our 3-year-old Husky Pepper loves it, too! Awe mannnn! Wow...better than restaurant! Made this with fresh grown tomatoes from the garden. Third time making this and unbelievable. Served with spaghetti, corn (from garden) and salad. As always, "We enjoyed!" Thanks! Glad you like it so much. Try partially cooking the eggplant slices on a screaming hot grill pan. Same low-oil, low-caloric effect, but you also get attractive grill char marks. I made this last night with a couple of changes. I used some Fontina and Pecorino Sardo cheese I had on hand, along with Parmigiano-Reggiano. I also softened the eggplant rounds on a very hot grill pan. I used passata (thin, uncooked tomato sauce in a bottle common here in Italy) for the sauce, but since it's quite plain, I sauteed a diced onion for a few minutes before adding the garlic and diced eggplant and then added some dry oregano when I added the passata. The end result was wonderful. This is now on my "keeper" list. Ever thought of making Eggplant Lasagna? Getting round slices to be layered in a square dish is a conundrum! Hello Chef John! I made this today for my former American host family and it turned out absolutely delicious! Since my eggplants were a little small, I used three and did not fill them taco style but just layered them lasagna style. I will definitely make it again, when I get my hands on ricotta again. Or I'll try with German Quark when I'm back. Thanks for all your recipes. Each I have tried turned out delicious! Chef John your awesome! You made me love cooking! Whenever I am looking for a recipe I search your blog first! I once had eggplant parm at an Italian restaurant that set the bar and have struggled for 20 years to duplicate it with marginal success. The texture was like custard, the flavors were subtle and woven, it left me yearning for more now 30 years later. One point I've arrived at is that the cheese and tomato sauce need to be restrained to avoid the gloppy mess we usually serve. The other is that the eggplant probably should be pre-cooked in some fashion, and then the dish assembled and heated. I have the tomato and cheese parts of the equation to satisfaction, the search is now for how to impart the eggplant with the subtlety of texture and flavor. It may be in the quality of the breadcrumbs and oil, but my sense is that it was somehow made absorbent and took up a significant amount of egg, and the egg may have been a custard rather than just whipped egg.